You sometimes take your truck places where you need extra protection from road debris and off-road brush. 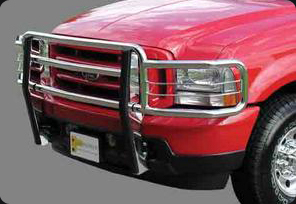 When you do, you need the Rancher Grille Guard(tm) for full size trucks and SUVs from Go Industries for total protection anywhere you take it! Westin's Ultimate Bull Bar adds extra front-end protection, maximum ground clearance and the perfect finishing touch to your truck or SUV. 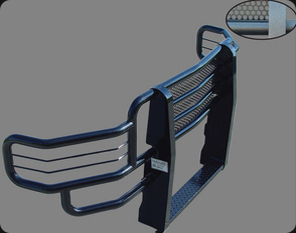 Bull Bars for full-sized trucks & SUVâ€™s are manufactured from 3" diameter tubing and introducing the new 2.5" diameter Bull Bar for compact, midsize trucks and SUV's. Choose from chrome plated stainless steel or a black powder coat finish. Black molded end caps have been added to the crossbars and Westin's logo is laser-cut into the stainless steel skid plate. Skid plate & Mount Kit included. Add a set of Westin's Driving lights to complete that customized look. You've got the big truck with the big engine and big tires! 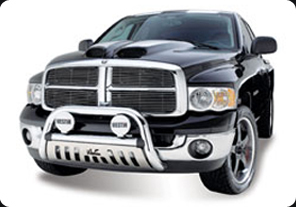 Now what you need is the exclusive Big Tex Grille Guard(tm) from Go Industries.